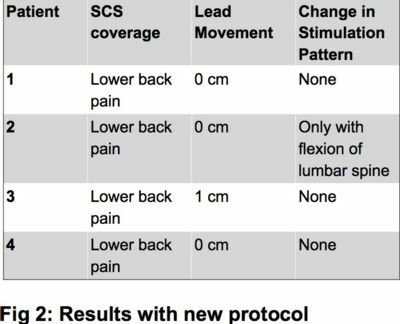 P013: QUALITY IMPROVEMENT PROTOCOL FOR SPINAL CORD STIMULATOR (SCS) LEAD TRIAL PLACEMENT WITH CHLORHEXIDINE-INTEGRATED GEL TEGADERM DRESSING FOR SHORT TERM STABILIZATION OF SCS LEADS. INTRO: To create a protocol for SCS trial lead fixation with a chlorhexidine-integrated gel tegaderm dressing to minimize migration of SCS leads and change in stimulation pattern. BACKGROUND: The use of Spinal Cord Stimulators (SCS) to control various etiologies of pain has been supported by evidence-based studies2 to help neuropathic pain, failed back syndrome, reflex sympathetic dystrophy, and pain from lower limb ischemia, angina pectoris, renal pain, pelvic pain, and chronic visceral abdominal pain5. SCS was developed over 40-years ago where Shealy et al. reported electrical stimulation of the dorsal columns of the spinal cord could be used to inhibit pain1. This is supported by the gate control theory of Melzack and Wall6 suggesting that stimulation of an afferent nerve at the dorsal column of the spinal cord inhibits pain transmission and suppresses sympathetic activity. For SCS implantation, a pulse generator is connected to leads that are positioned in the posterior epidural space3. Recently, SCS has become increasingly successful due to improved patient selection and accuracy of electrode placement4. Lead migration is the most common, and correctable, problem in SCS implantation7. Another problem is change in SCS stimulation pattern. We investigated the use of chlorhexidine-integrated gel dressing, for stabilization of SCS leads in preventing lead migration and change in stimulation pattern. 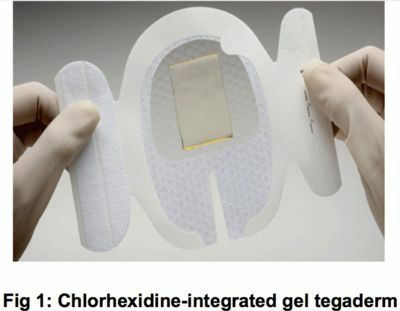 METHODS: We placed the chlorhexidine-integrated gel tegaderm dressing over the SCS leads once SCS trial was completed, and made a marking at the edge of the dressing and on the skin with a marker. When patients returned for lead removal, we measured the markings to determine if there was lead movement. We also inquired about change in stimulation pattern compared to stim pattern on day of SCS trial. All patients had a two-day SCS trial, coming in on the third day for lead removal. DISCUSSION: In our series of patients, we found that placing a chlorhexidine-integrated gel tegaderm over lead sites decreased migration of leads and change in stimulation pattern. SCS trial leads can be secured with a variety of dressings, and biologically-treated dressings, such as the one we used, have been shown to be more effective than conventional dressings by prevention of scab formation, being cost and time effective, providing a barrier against bacteria, and making wound care easier8. 1. Barolat G et al.Future trends in SCS. Neurol Res 2000;279-284. 2. Cameron T.Safety and efficacy of SCS for the treatment of chronic pain:20 year review.J Neurosurg 2004.100:254-267. 3. Kumar K, et al.SCS in treatment of chronic benign pain: challenges in treatment planning and present status, a 22-year experience.Neurosurgery 2006;58:481-496. 4. Kumar K et al.SCS versus conventional medical management for neuropathic pain: a multicenter-RCT in patients with failed back surgery syndrome.Pain 2007;132:179-188. 5. Manchikanti L et al.Comprehensive evidence based guidelines for interventional techniques in management of chronic spinal pain.Pain Physician 2009;12:699-802. 6. Melzack R, Wall PD.Pain mechanisms: a new theory.Science 1965;150:971-979. 7. Rheinecker SB.Wound management:the occlusive dressing.J Athl Train.1995;30:143-146.